Quinn to Lead U.S. Juniors - College Hockey, Inc.
All-college coaching staff set for World Junior Championship. 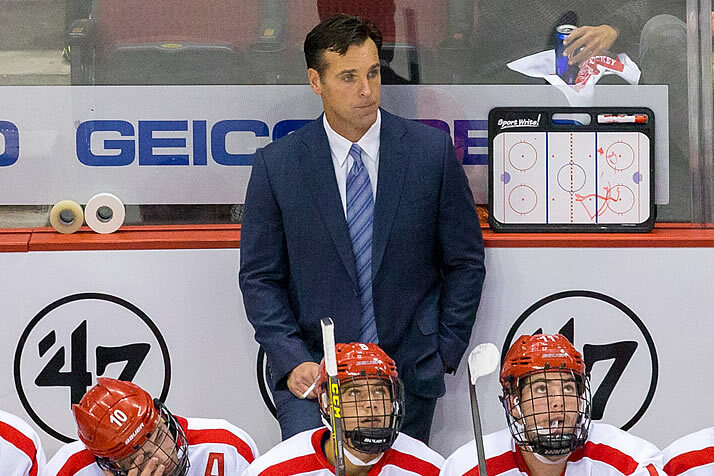 David Quinn has led Boston University to four straight NCAA Tournaments. The United States will seek gold at the 2019 World Junior Championship with an all-NCAA coaching staff, led by Boston University head coach David Quinn in the head coaching role. Quinn will be joined behind the U.S. bench by Minnesota State head coach Mike Hastings, Dartmouth associate head coach David Lassonde and Ohio State associate head coach Steve Miller. The U.S. will be seeking a medal for the fourth consecutive year at the World Junior Championship, which will be held Dec. 26 to Jan. 5 in Vancouver and Victoria, British Columbia. Quinn, whose coaching resume includes a stint with USA Hockey’s National Team Development Program, has been part of the U.S. coaching staff at seven previous IIHF world championship events, but will serve as head coach for the first time. This marks the third consecutive year that an NCAA head coach will lead the U.S. entry at the World Junior Championship, with Quinn following in the footsteps of current Minnesota head coach Bob Motzko (2018, 2017). This season marked Quinn’s fifth as the head coach at his alma mater, as he led the Terriers to their fourth straight NCAA Tournament appearance. He has won two Hockey East tournament titles and one Beanpot in his time behind the BU bench. Hastings, likewise, has led Minnesota State to four NCAA Tournaments in his six years leading the Mavericks. He returns for his third stint as assistant coach of the U.S. National Junior Team (also 2005, when he and Quinn were assistants, and 2003). Lassonde is also making his third appearance as an assistant coach with the U.S. National Junior Team. He helped the U.S. claim gold in the 2013 event and also served as an assistant coach in 2014. Miller will be assisting the U.S. team for the third year in a row, having won gold in 2017 and bronze in 2018. The 2019 U.S. National Junior Team coaching staff was revealed on NHL Network Friday.